The Industrial and Technological Revolutions that started in the early 1800s paved the way for our modern way of living. Machines, electricity, motorized vehicles, and automated production processes replaced laborious and inefficient human-powered methods. However, to obtain the means to power humanity’s machinery, we exploited and harmed Mother Nature. With these Revolutions, it seems that technology and nature will forever be branded as adversaries. But in Burgos, Ilocos Norte, the opposite is true. Technology and nature are symbiotic to each other. Following our throat-wrenching yet exciting 4X4 ride in the La Paz Sand Dunes, it was time for another adventure. A mid-day snack after the adventure still sat heavily in our tummies, so we decided to skip lunch and headed to the bus station to catch a ride to Burgos. After more than an hour on the road, we stopped at a T-junction that led us to Kapurpurawan. We hired a couple of tricycles to take us to the edge of the coast. As we rode along a lonely stretch of road, we encountered humongous, white structures all around us. Windmills! 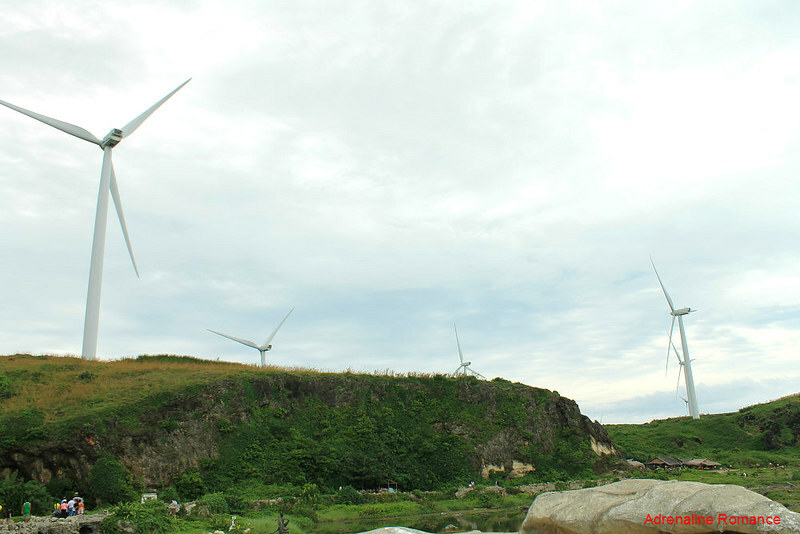 We have arrived at the Burgos Wind Farm, the second wind farm constructed in Ilocos Norte after the more popular shore-based Bangui Wind Farm. 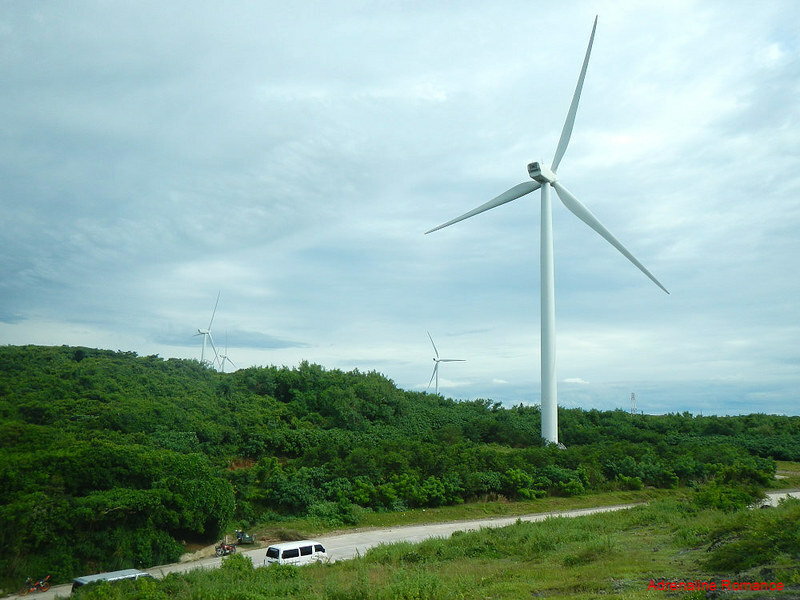 Covering an area of 600 hectares and encompassing three barangays, the Burgos Wind Farm is the largest of its kind in the country and in Southeast Asia. 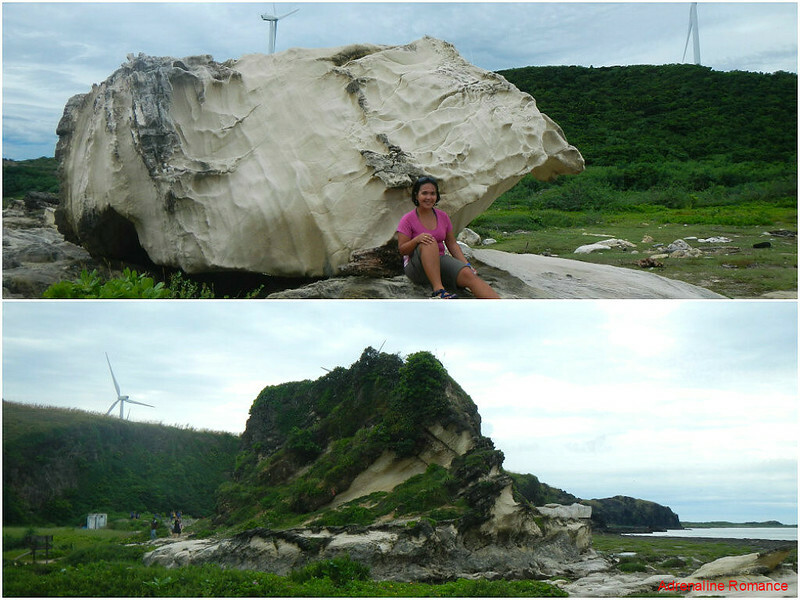 Check out the photo below so you’ll have an idea of the size of each of these monster windmills. Look at how that windmill dwarfs the van in the foreground. The wind farm is made up of 50 of these gargantuan Vestas turbines. Each windmill is 230 feet tall (equivalent to a 20-storey building) with 135-foot long blades. The rotor has a diameter of 269 feet and a wind-swept area of almost 57,000 feet. Those numbers are not to be easily reckoned with! Each turbine is capable of producing 1.65 megawatts of electricity. Together, the 50 windmills generate about 233 gigawatt-hours of electricity annually. That’s enough to power more than a million households! Energy Development Corporation, the entity that owns the wind farm, is focused on producing clean energy with Burgos at the forefront. In fact, this is the first Philippine energy-based project that the Department of Energy deemed eligible for the department’s feed-in tariff (FIT) scheme. Under such scheme, Philippine Energy Regulatory Commission can assure a fixed rate per kilowatt hour for EDC as a power producer. 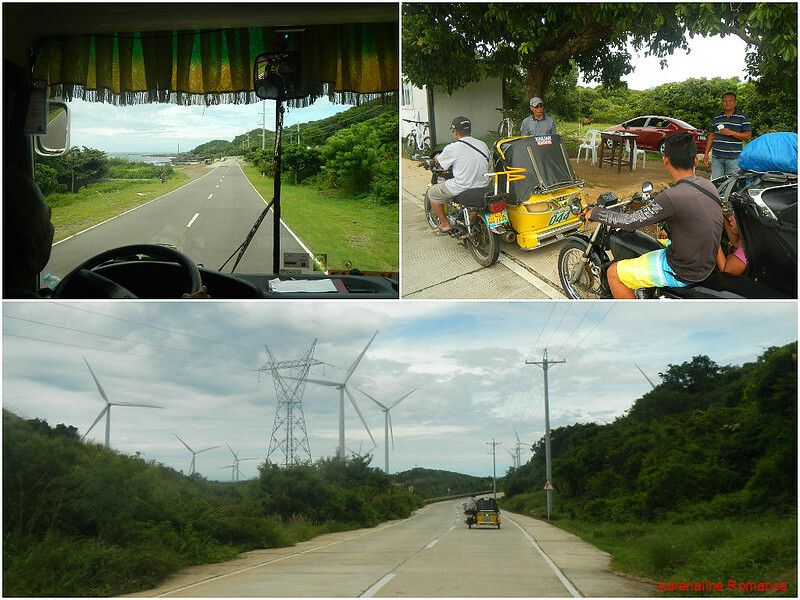 The Burgos Wind Farm is a prime example of sustainable and clean power generation. It shows that with willpower, determination, and a change of mindset, we can use technology the right way to help solve our energy crisis. It was still 2 PM, but the visitor’s area was quite filled with throngs of tourists who wish to see, experience, and photograph stunning landscapes. We will get to that in awhile. First things first. We ate several of the famous Ilocos empanada and some leftover bagnet (yes, they still survived after we packed some leftovers in Vigan‘s Hidden Garden) as a filling late-lunch in one of the carenderias in the visitor’s area. 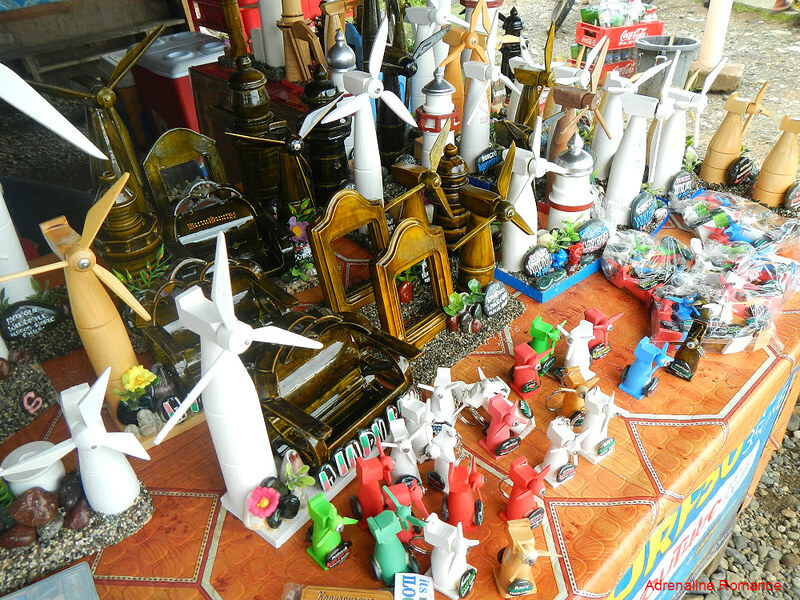 Check out those pretty handcrafted souvenirs of the Vestas windmills! These items are a clear testament to the skill and creativity of local craftsmen and artisans. We bought a few key chains and ref magnets. After lunch, it was time to check out the spectacular rock formations we have heard so much about. The gateway to these formations is this cool, dark trellis made of climbing vines. We followed a short dirt path that led to the quiet, rugged shore. 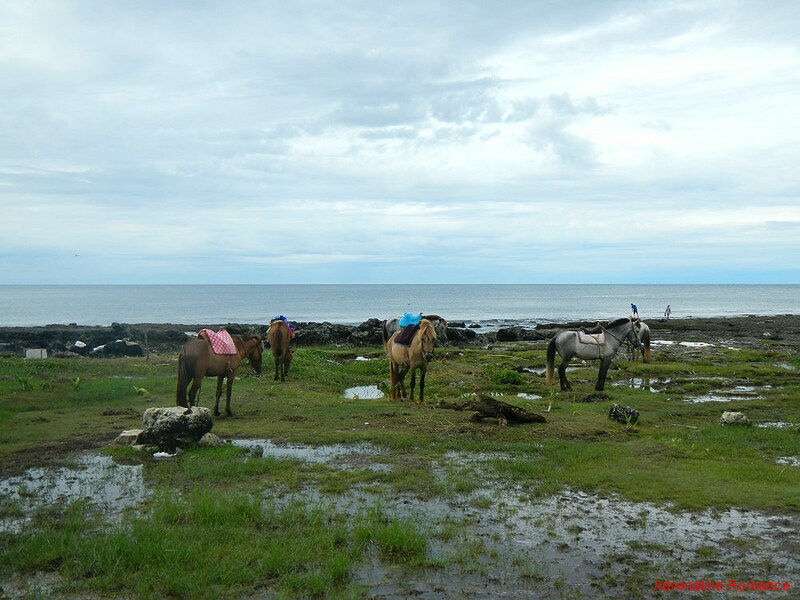 The place is so serene that these big horses stopped to enjoy the kiss of the salty sea breeze and listen to the melody of the gently crashing waves. 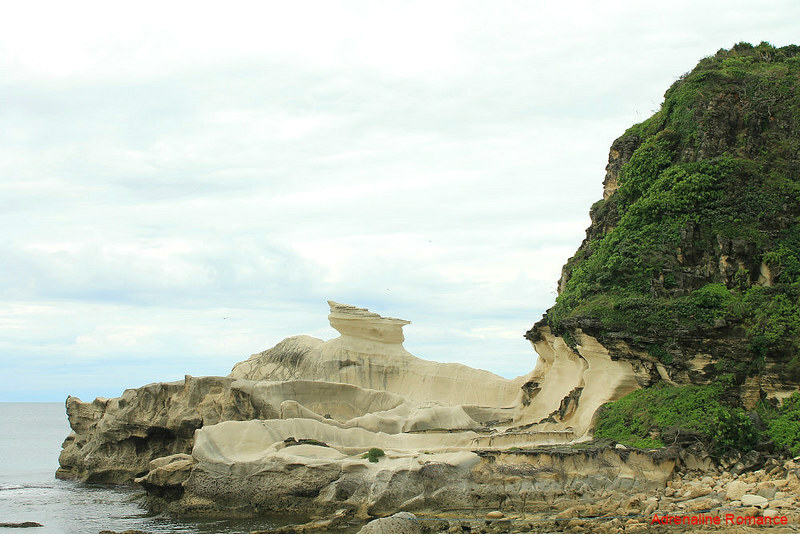 Even at a distance, the Kapurpurawan Rock Formation is a geological monument of striking artistry. The formation is naturally hewed out of a single rocky hill that has been sheared off by the forces of Mother Nature. The rock is not bare. 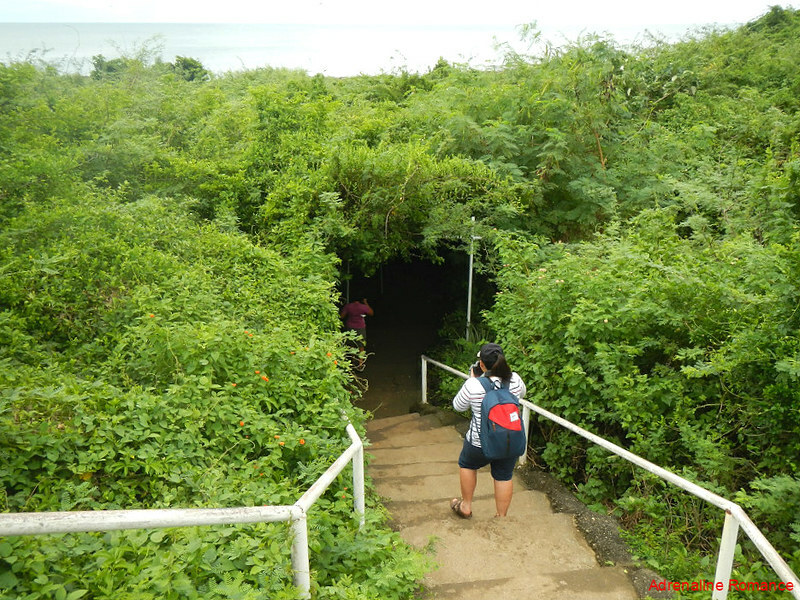 Indeed, it is covered with vegetation that serves as dwelling places for sea birds, reptiles, and mammals. Check out that calm tidal pool that reflects a mirror image of the formation and the sky. Beautiful, isn’t it? 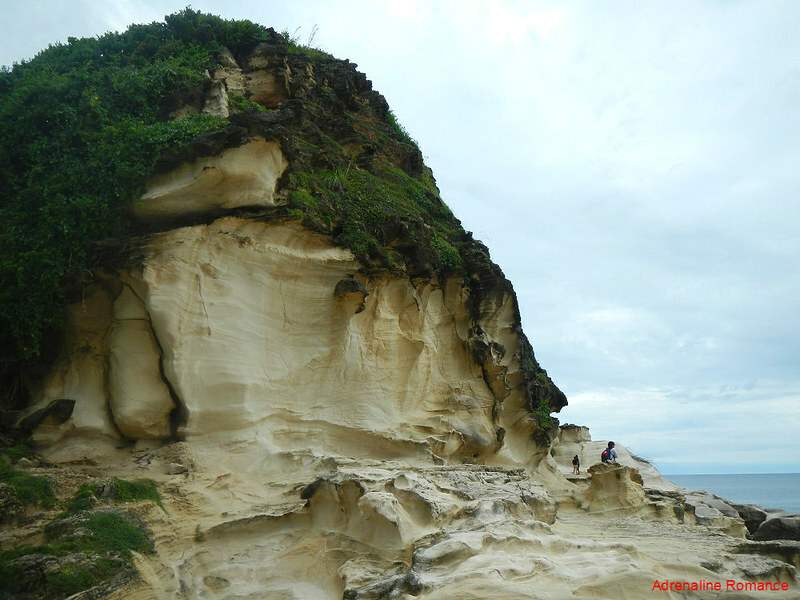 Getting to the Kapurpurawan Rock Formation requires a short hike. If walking along the dirt road is not your type of thing, then you can ride a horse. Horseback riding trips are available at reasonable prices. 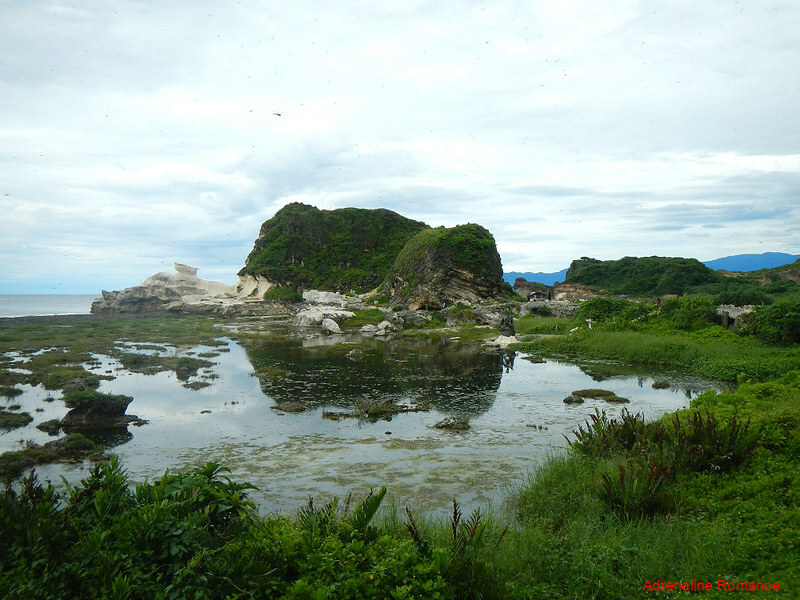 A few years ago, visitors had to skip on rocks, wade in marshes, or walk on mud to get to the rock formation. 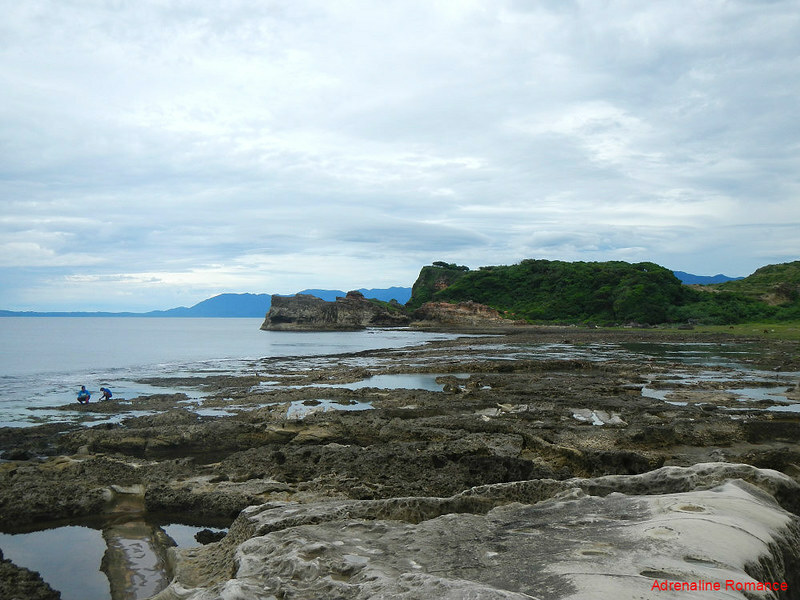 Now, things are so much easier because the LGU built footpaths, bridges, and stairs that lead to the rock formation. Although considered unsightly by environmental purists like us, we do understand the benefits of such structures. They restrict foot traffic to a given area, which protects the surrounding areas from damage or destruction. The trail also inhibits people from veering away to more dangerous places around the formation. 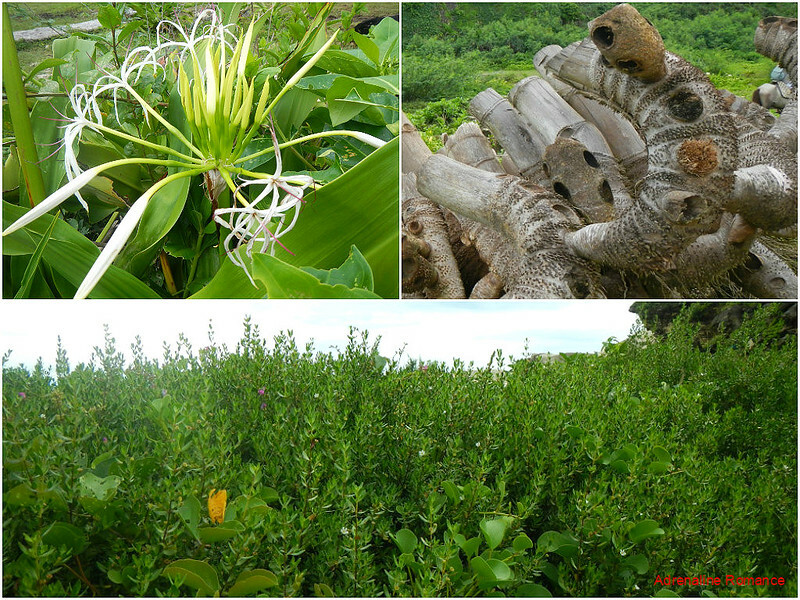 Along the way, we saw weird flowers and thickets as well as strangely shaped driftwood. Are these species endemic in Burgos? Smaller boulders and promontories dot the way to the rock formation. Erosion carved interesting dents, lines, and cavities in their surfaces, making them small but beautiful natural works of art. 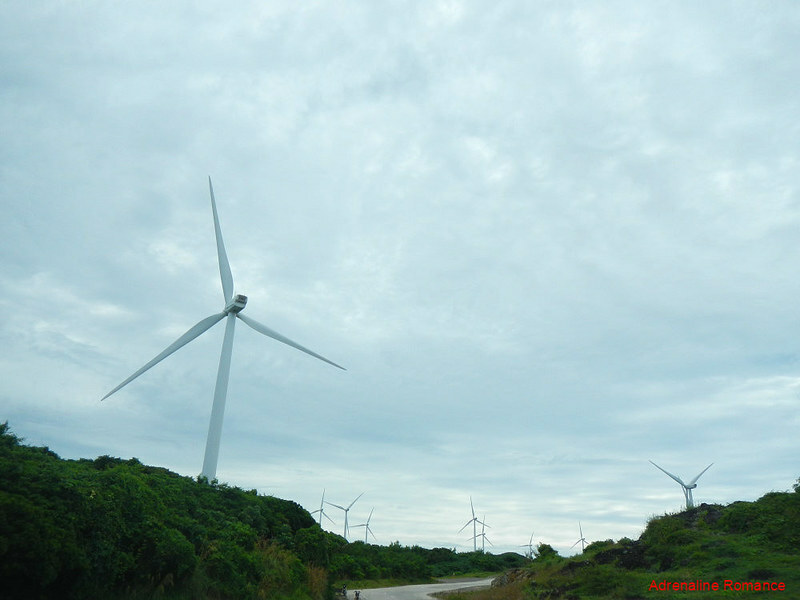 Like giant swashbuckling sentinels, the Vespas wind turbines stand guard over this Ilocandia version of Arcadia, the soft hum of the rotor blending well with the din of the sea. Despite their artificiality, they surprisingly blend well with the surrounding scenery. 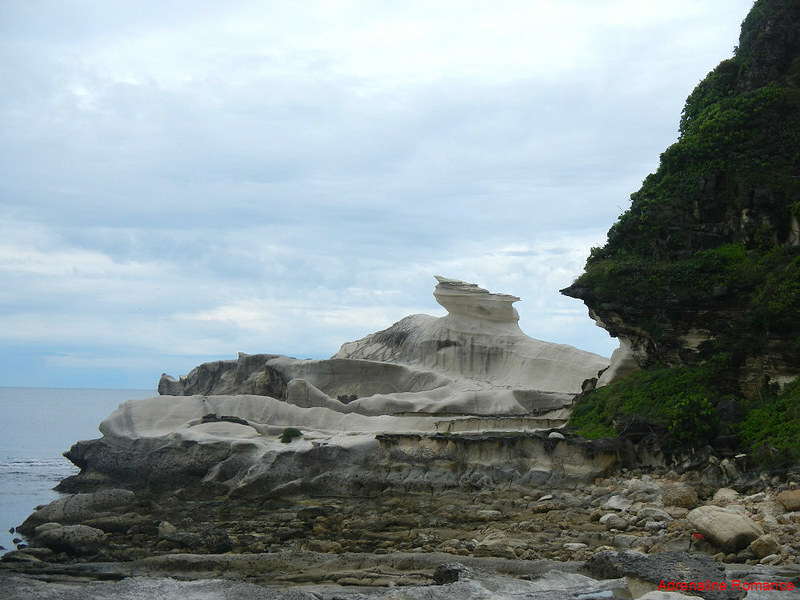 This anvil-shaped rock forms the centerpiece of the Kapurpurawan Rock Formation. However, many visitors do not interpret it as an anvil. They look at it as a ship, a submarine, a sleeping dragon, the back of a whale, and more. What do you think? The limit is your imagination. Due to its fragile nature, climbing up this rock is now prohibited. However, the other side of the formation is a whole lot tougher, and people are permitted to climb up the rock with care. Let’s go there, shall we? Oh yes, the scenery on the other side is equally stunning! It looks like a verdant landscape ripped off from a fantasy novel, like a narrow valley that leads to another realm. What greeted us merited a gasp of amazement. 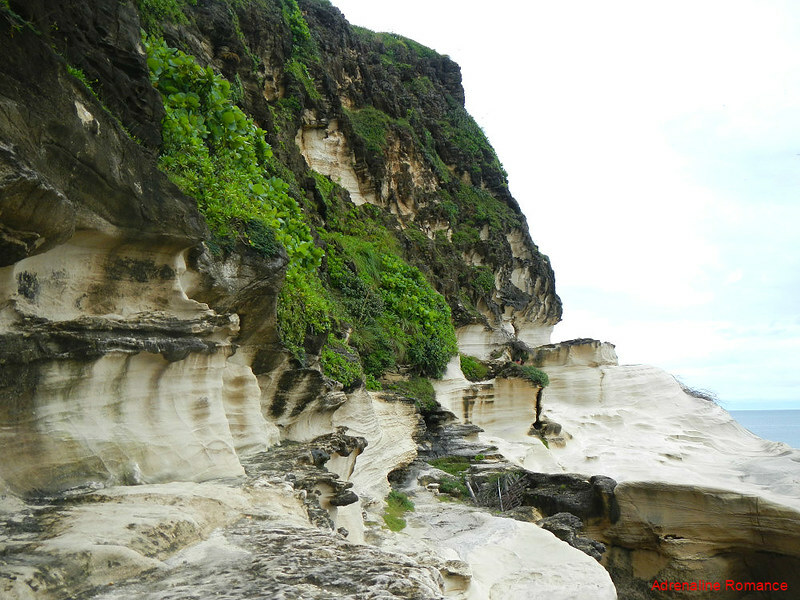 A huge section of the cliff was cleaved off, leaving a gigantic white spot of the hill’s muscle. Was this the product of man’s destructive hand? Fortunately, no. This is the result of thousands of years of erosion by the combined onslaught of sea, rain, and wind. The namesake of the formation, Kapurpurawan, comes from the Ilocano root word “puraw.” In the local dialect, puraw means white or pure. 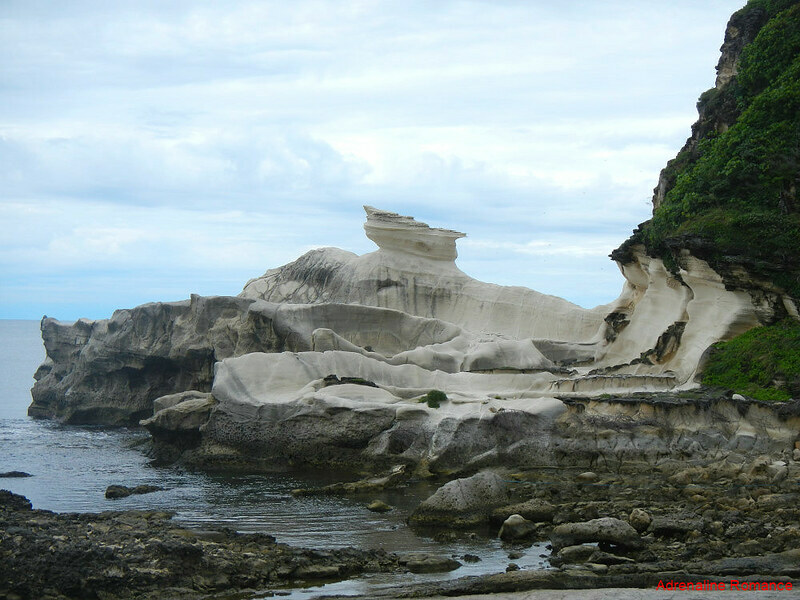 Therefore, the old locals named the place Kapurpurawan due to the creamy white clefts carved from erosion. The cliff face is not straight. Rather, it is marked with jagged lines and sharp curves, topped with local vegetation. It is Mother Nature’s artistic hand at her finest. Our friend Lorraine stands on one of the carved faces of the hill. As you can see, this rock formation is primarily made of compacted sandstone. Sandstone is a type of sedimentary rock sand-sized minerals, crystals, and rock grains. Although you can’t see it from the photo below, the texture of the rock is rough as if made from solid sandpaper. The ebbing tide exposed large tidal pools and mud flats, all unique ecosystems in themselves. We saw two young locals scrounging the natural pools for treasures and interesting things that the sea left behind. And oh, is that another interesting rock formation in the background? The white windmills of the Bugos Wind Farm look perfectly in place in the background of stunning rock formations and green hills. A mutually beneficial symbiosis is evidently at work here. Now, it’s up to us, locals and visitors, to help make it stay that way. As you, dear readers can see, technology and Mother Nature can indeed work hand in hand. All we need to do is to adopt a different mindset and a good dose of willpower. If humanity’s genius gave birth to the Industrial and Technological Revolution, if our specie’s creativity led us to creating modern miracles, then it is definitely possible for us to create technologies and methods that will be beneficial to both Mother Nature and modern civilization. ** Rate is per tricycle. 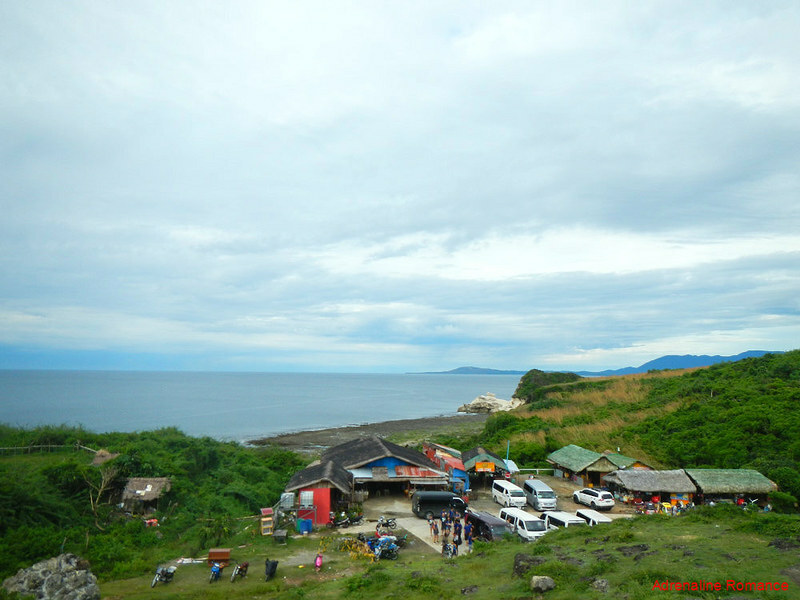 If your starting point is from the town proper of Burgos or if you wish to be ferried from one tourist spot to the other, an additional P50 per tricycle will be charged. 1. For safety reasons, do not go beyond roped or fenced sections. Take heed of the signs. Take extra care when walking on rocks, cliff edges, and tidal pools. 2. The Burgos Wind Farm is a private property. Do not go beyond the fences that demarcate the property. 3. 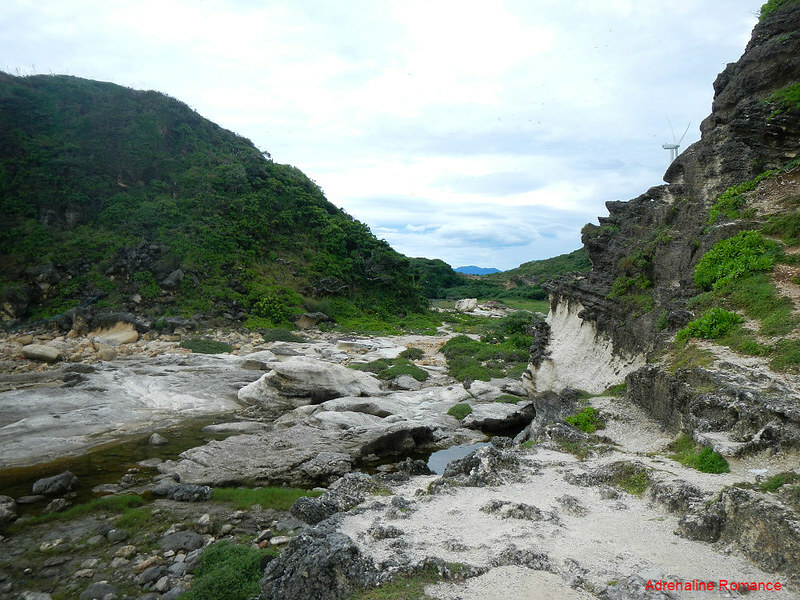 The hike is quite easy, but you can get quite sweaty, especially during a hot day. 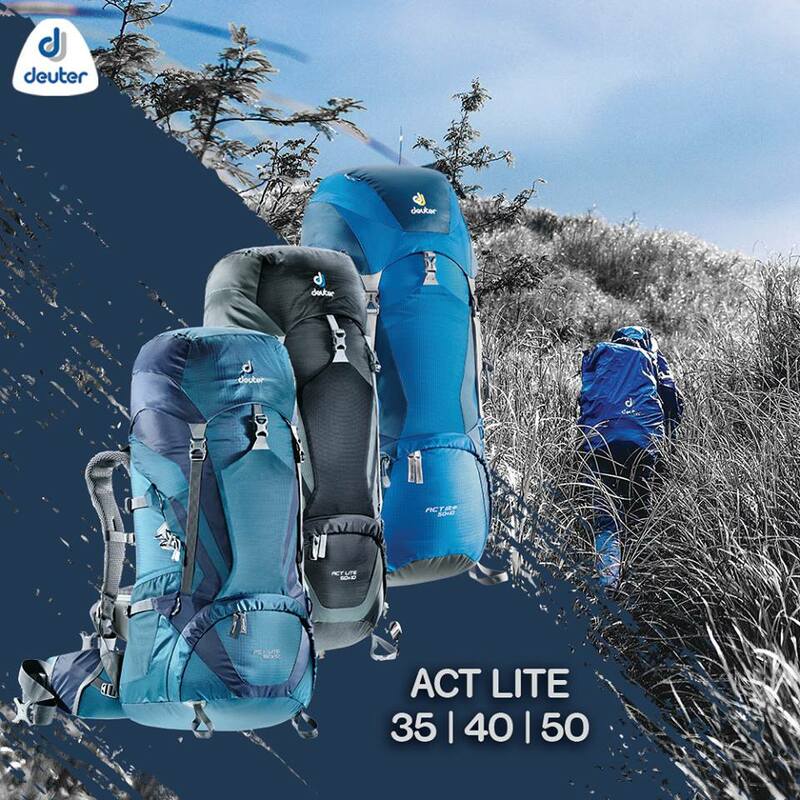 Bring a fresh change of clothes with you. 5. Observe the Leave No Trace principle. Do not litter or vandalize. Sad to see pristine areas spoilt with these things. Another few years they’ll be obsolete rusting pieces of junk and nobody to haul away the bits. I couldn’t disagree with Pete’s comment above more, although he might be right about them becoming obsolete at some point, they are certainly a mark of hope in the world I think. What would he prefer? A power station there? I found this whole post fascinating actually. I would never have imagined that a wind farm could become a tourist attraction, but there you are! Beautiful and weird- thanks for sharing! We agree with you. The world has been looking for ways to generate power in a clean and sustainable way. This wind farm is one of those ways. And personally, they’re not eyesores. The wind turbines actually blend well with the natural scenery. 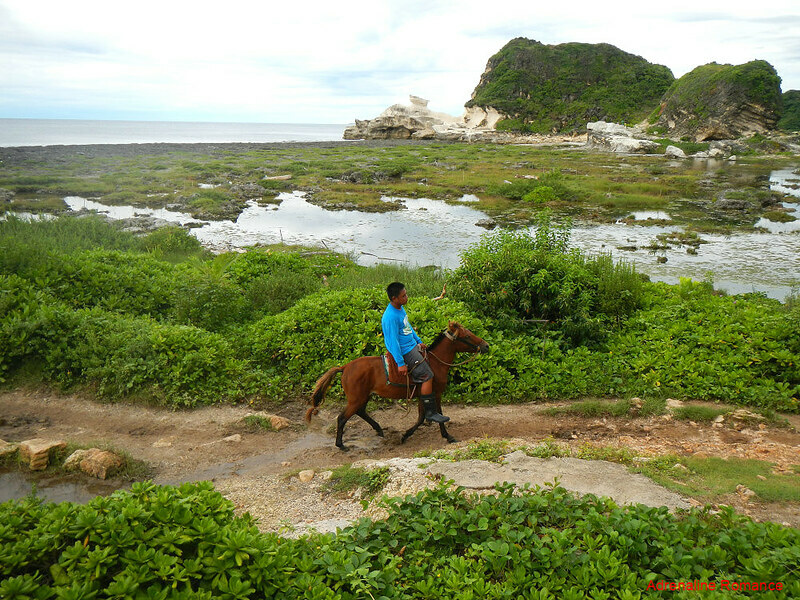 Oh how I miss Ilocos! This made me crave for Vigan Longganisa & Empanada! The Ilocos empanadas are giants of delight! Very tasty! We also love the bagnet, especially when dipped in very spicy vinegar with pepper, garlic, and onion. Mmmm! Don’t worry; we believe those turbines will be taken cared of since they are essential to the generation of electric power in the entire Luzon area. I love interesting natural formations such as these – Mother Nature really can be incredible sometimes! As for the turbines, I actually find them quite beautiful. We have some near my home here in Wales, although nowhere near as large as these giants, and the way they sort of peek over at you from behind the mountain is sort of like a welcome home as you drive into the valley. Yes, we definitely agree with you. For us, Mother Nature is the universe’s best sculptor. About the windmills, that’s what we thought as well. They sort of like peek over the hills; we saw some of the tops of the turbines even when we were still at the crossing, which was a mile or so away. Wow what a fantastic trip! I’ve always wanted to go to a wind farm. 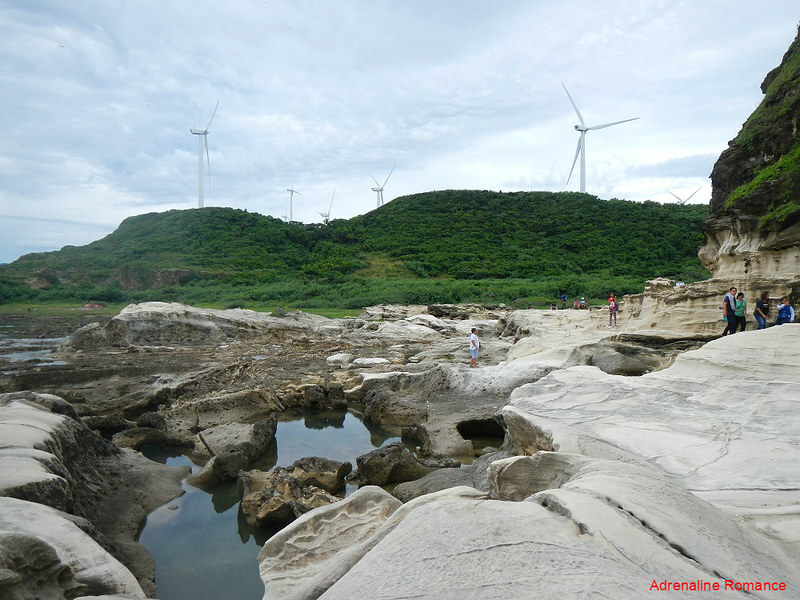 I never knew you could do a wind farm, rock formation and tidal pools in all one though! The rock formations look incredible! One of the pictures makes it look like you are standing on a white sand beach, not a rock! Also, love the perspective photo showing how massive those windmills are! Yup! It’s actually sandstone—sand that is fused solid into a rock by the forces of the sea. 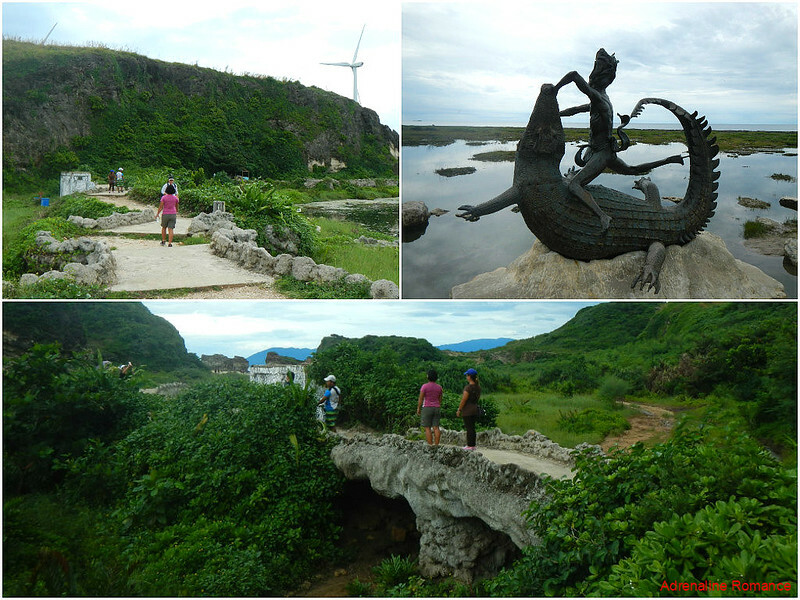 The windmills really blend with the landscape; the harmony of technology and nature definitely surprised us. How interesting– hopefully they are well taken care of like you suggest. The rock formations are quite interesting to see. I have seen wind farms but never visited one! Oh, don’t worry. 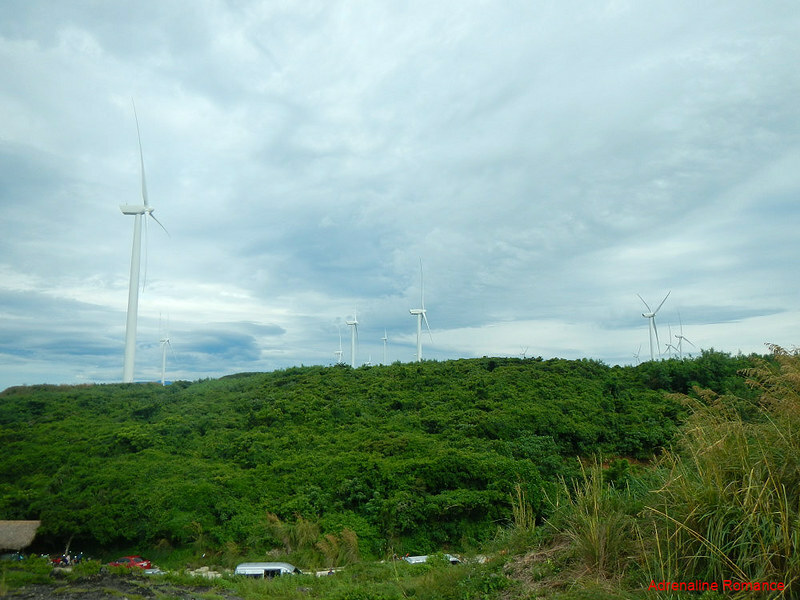 The wind farm is integral to Luzon’s power generation, and it is owned by a private company rather than a government entity. So, we’re sure they will be well maintained. 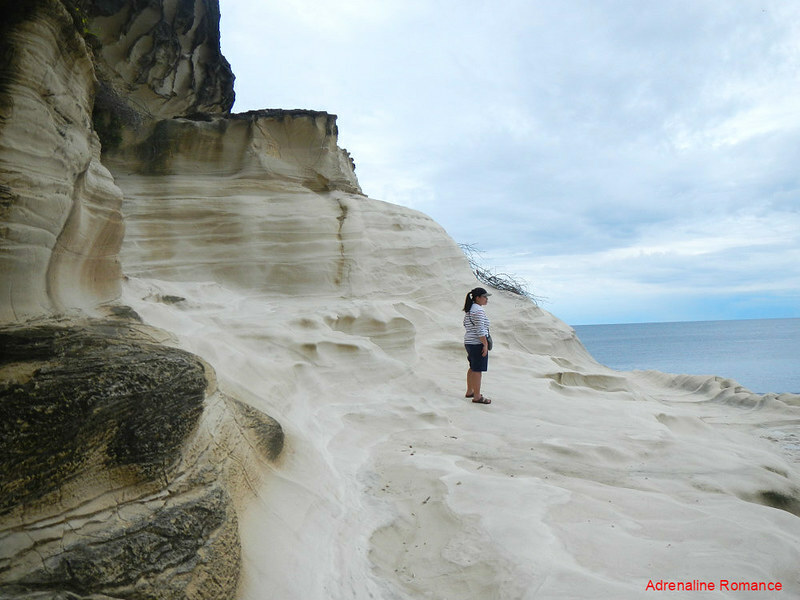 The rock formations are truly awesome! Who knew a wind farm could be such a tourist attraction. It’s awesome that this place is doing its part and generating renewable energy. Thanks for sharing!